Use the coupon code SILEO at the checkout to get your 20% discount. It’s Cyber-Monday and I’ve got some discounts for you. I’ve cut the price on Setting Course to $6.49. We Believe, the book containing the Three Forms of Unity, is now at $6.95. By using the code CYBERMONDAYCA305 you can get another 30% off at the checkout. The proceeds on these books go to good causes: Setting Course supports the building fund at my church; We Believe supports the Reformed Reading Room in Recife, Brazil. Great news! Lulu now offers shipping from Canada. This reduces the shipping costs for Canadian buyers. Additionally, by using the code CYBERMAY you can get 25% off until May 31. 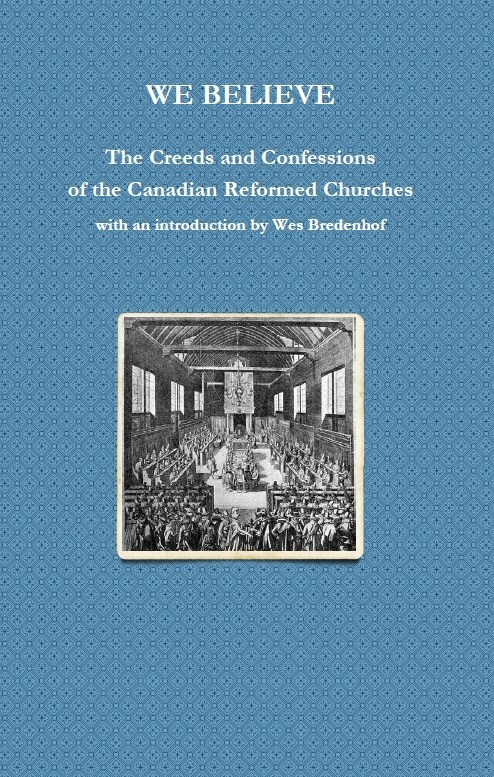 We Believe contains the creeds and confessions of the Canadian Reformed Churches. Besides the excellent editions of these documents, you’ll also find an introduction, all the proof-texts, the historic original prefaces (rarely published), and a topical index. All proceeds go to support Reformed mission work in north-eastern Brazil. You can order it here. Remember to use the code CYBERMAY to get 25% off! We Believe — Now Shipping from Canada & 20% Off! Great news! Lulu now offers shipping from Canada. This reduces the shipping costs for Canadian buyers. Additionally, by using the code LUCKYCA305 you can get 20% off until Monday May 16. We Believe contains the creeds and confessions of the Canadian Reformed Churches. Besides the excellent editions of these documents, you’ll also find an introduction, all the proof-texts, the historic original prefaces (rarely published), and a topical index. All proceeds go to support Reformed mission work in north-eastern Brazil. You can order it here. Remember to use the code LUCKYCA305 to get 20% off! We Believe — ON SALE! We Believe is the only edition of the Three Forms of Unity that includes all the original prefaces. From now until April 26, you can get 20% off your order by using the code HOPCA305. All proceeds go to support Reformed mission efforts in north-eastern Brazil. Click here to order.